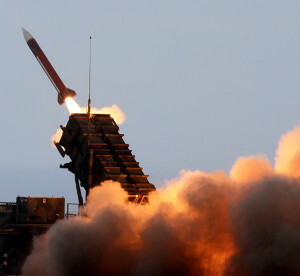 A Patriot missile leaves the launcher tube on its way to intercept a target. The Army needs more air defense capabilities for the future multi-domain battle, said Maj. Gen. Bo Dyess, acting director of the Army Capabilities Integration Center. He spoke during the AUSA Global Force Symposium in Huntsville, Ala., March 13, 2017. In tomorrow’s complex battlefield, the Army will need stronger air defense systems to counter emerging anti-access/anti-denial capabilities and free up airspace for friendly aircraft, said Maj. Gen. Bo Dyess, acting director of the Army Capabilities Integration Center. 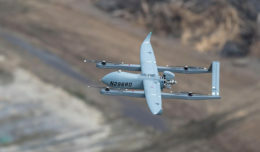 The Air Force could then fly unimpeded during combat operations and provide close-air support to help ground troops move freely in contested areas. According to Dyess, the Air Force is “very close” to collaborating with the Army on the multi-domain battle concept in preparation for future warfare, which planners predict will involve Soldiers fighting in dense urban areas against near-peer enemies. In February, the Army and Marine Corps published a white paper providing an overview of what ground troops may face in 2025-2040. In addition to discussing other potential threats, the four-page document states that Russia and China continue to improve and export integrated air defense systems, which can allow ground forces to establish air superiority on their own. The white paper also states that ideas expressed in it will likely be refined and expanded based on input from the other services. At AUSA’s annual meeting in October, the Army officially announced the multi-domain battle concept, which is meant to broaden how the service fights on land — sometimes with the assistance of air assets — and allow for the incorporation of capabilities in the maritime and cyber domains. Also during the meeting, leaders representing all services participated in a panel discussion, expressing their support of the concept. Last week, Air Force Chief of Staff Gen. David Goldfein rolled out a new concept called multi-domain command and control, which is intended to improve situational awareness, rapid decision making and employment of Air Force assets in future warfare. U.S. Army Pacific has also been working directly with the joint Pacific Command, headed by Navy Adm. Harry Harris Jr., to finalize exercises to test and develop new multi-domain capabilities. 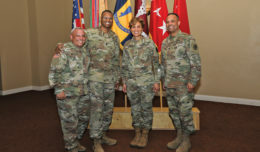 Army Training and Doctrine Command has been developing the multi-domain concept and is now incorporating aspects of it into the Army Doctrine Publication 3-0, which outlines a common operational concept for Army forces, he added. Improving interoperability with coalition partners is also a key part, he said, since they could support the U.S. Army against near-peer enemies. 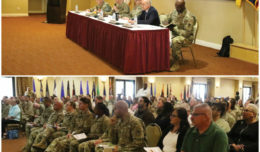 Last year, he noted, British, Australian and Italian military members, among other foreign troops, took part in an Army Warfighting Assessment at Fort Bliss, Texas, to test new capabilities like robotics and autonomous weapons systems. Maj. Gen. Bo Dyess, acting director of the Army Capabilities Integration Center, talks about the multi-domain battle concept during a panel discussion at the Association of the United States Army’s global force symposium in Huntsville, Ala., March 13, 2017. Soldiers are also doing their part in envisioning future fighting capabilities, said Paul Rogers, director of the Army Tank Automotive Research, Development and Engineering Center, or TARDEC. Through Soldier innovation workshops, he said, young NCOs are plucked from their units to team up with creative design students from an industrial design college in Detroit to draw up capabilities the Soldiers would like to see in combat. A dozen NCOs and up to 20 designers typically come up with nearly 300 advanced concepts over a 2 1/2-day workshop, he said Monday at the symposium. 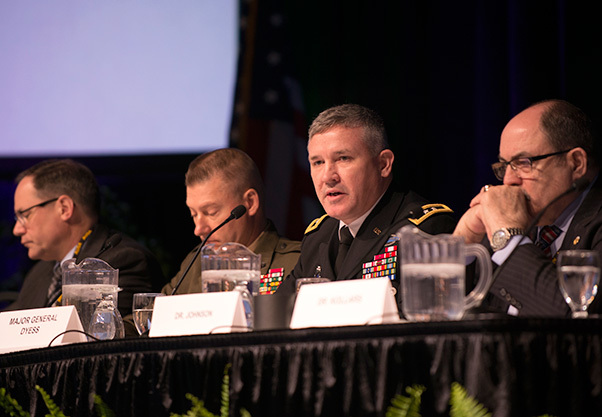 In the near future, Army leaders plan to delve deeper and identify gaps in the capabilities that may be needed to fight in a multi-domain environment. At an event slated for August, specific gaps will then be addressed to industry partners, allowing them to hone in on their efforts, according to Dyess. Examining capabilities in areas where the U.S. military has been dominant, like air supremacy, is also an important step in this process.